I was first introduced to Irish Soda Bread from my Irish friend. I was impressed with its flavor and rustic looks. I found a simple recipe in one of my cookbooks, and I love to make it for parties to impress my friends. This recipe is super easy and quick to make. Of course organic ingredients are the best to use for flavor and your health! If you have a baking stone, place it in the oven and heat it for an extra 10 minutes beyond preheating. Otherwise, you can lightly oil or butter a cookie sheet. Form a ball, then kneed the dough on a floured counter or cutting board until smooth, but not more than a minute. Shape it into a oval, approximately 7 to 8 inches across, then slash a cross or a “X” across the top with a knife. Place the shaped dough on the baking stone or cookie sheet, then bake until browned (about 35 minutes). Let cool for at least 30 minutes before eating. If you don’t have buttermilk, you can make your own by combining one tablespoon of vinegar or lemon juice to 1 cup of milk. Buttermilk contains lactic acid, which reacts with the baking soda to create tiny bubbles of carbon dioxide. 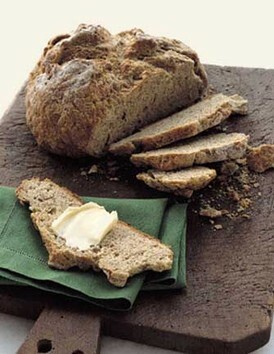 Irish soda bread is wonderful when served with butter, but I prefer it with good cheese! This recipe originates from the cookbook Vegetarian Cooking for Everyone. Image courtesy of World On A Plate.